WWII veteran Edmund DelBarone, second from right, makes the U.S. Navy crossed anchors symbol with his arms while posing for a photograph at Naval Station Newport, in Newport, R.I., Thursday July 27, 2017. 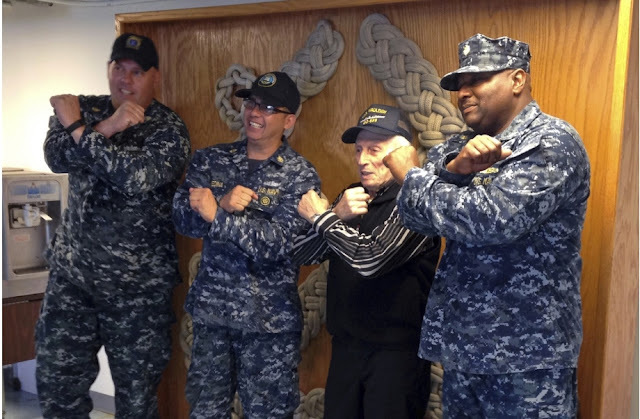 DelBarone, a 96-year-old World War II veteran, once dreamed of returning to a Navy installation to reminisce about his naval career, and help of a nonprofit it has become a reality. NEWPORT, R.I. — A 96-year-old World War II veteran who dreamed of returning to a Navy installation to reminisce about his more than 20-year naval career got his wish on Thursday. Edmund DelBarone toured Naval Station Newport in a visit arranged by Denver-based nonprofit Wish of a Lifetime. After seeing some of the ships assigned to the base, he said he’d have no trouble taking them out to sea.